The after section of Émile Bertin showing the 90 mm twin mounting. Sketch of 90 mm/50 Model 1926 gun and ammunition. Official drawing from the collection of Robert Dumas. This gun was an improved AAA weapon intended to replace the 75 mm (2.95") AA guns used on older ships. Used an autofretted barrel and a semi-automatic Schneider breech mechanism. ^All members of the Suffren class except Suffren herself carried this gun as their secondary battery. 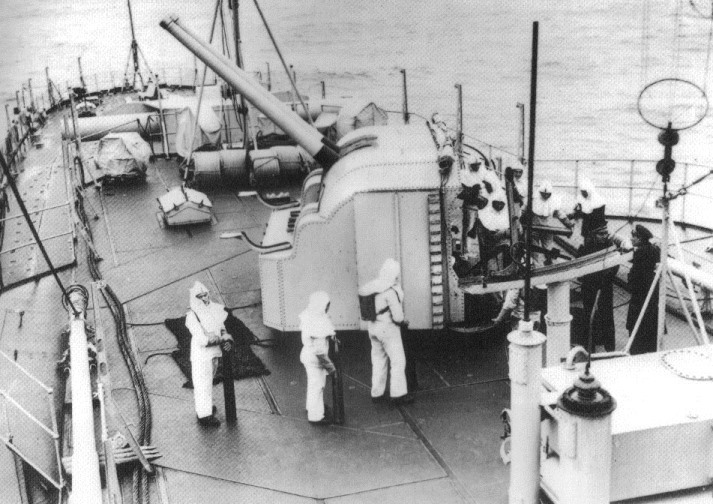 Suffren carried the older 75 mm/50 Model 1924. ^Loading proved difficult at elevations above 60 degrees and ROF dropped to around 10 rounds per minute. ^Émile Bertin had an inadequate ammunition supply system which could only supply 20 rounds per minute for all four guns. ^Émile Bertin had ammunition space for 1,422 rounds but the standard combat loading was 1,000 HE plus 200 illumination rounds for the center mounting. ^La Galissonnière carried 2,400 HE and 200 illumination rounds. ^A note on sources: "Cruisers of World War Two" by Whitley says that Émile Bertin was given two additional twin 90 mm mountings in place of her midships torpedo tubes during her August - November 1943 refit in the USA and includes a sketch showing the new armament (page 41). This appears to be taken from "The French Navy: Navies of the Second World War, Volume One" by Henri Le Masson (page 101). However, the removal of the torpedo tubes and addition of these mountings did not actually occur until her refit at La Seyne/Toulon between January and September 1945. At the same time a second HA transmitting station was fitted to enable target engagement on both sides of the ship, and the HA directors were given British Type 285 radar. 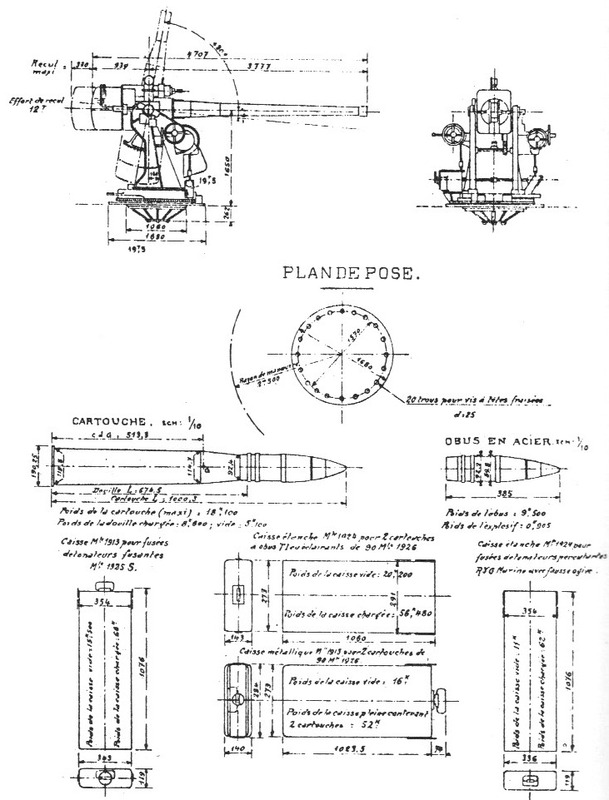 These additions gave Émile Bertin a total of eight 90 mm guns (3 x 2 and 2 x 1). The additional 90 mm mountings most likely were taken from the Jean Bart. ^2.12.2The single and twin mountings on Émile Bertin all fed from the same magazine. This magazine had a single hoist that could supply 20 rounds per minute, an inadequate supply for even two guns let alone the four that she carried. This hoist ended on the upper deck and the rounds had to be carried by hand to the mountings. From the photograph above, it does not appear that there was any ready round stowage close to the mountings to supplement the supply from the hoist. ^These mountings had automatic rammers but they were apparently difficult to load at angles over 60 degrees, thus limiting their effectiveness as AA weapons.